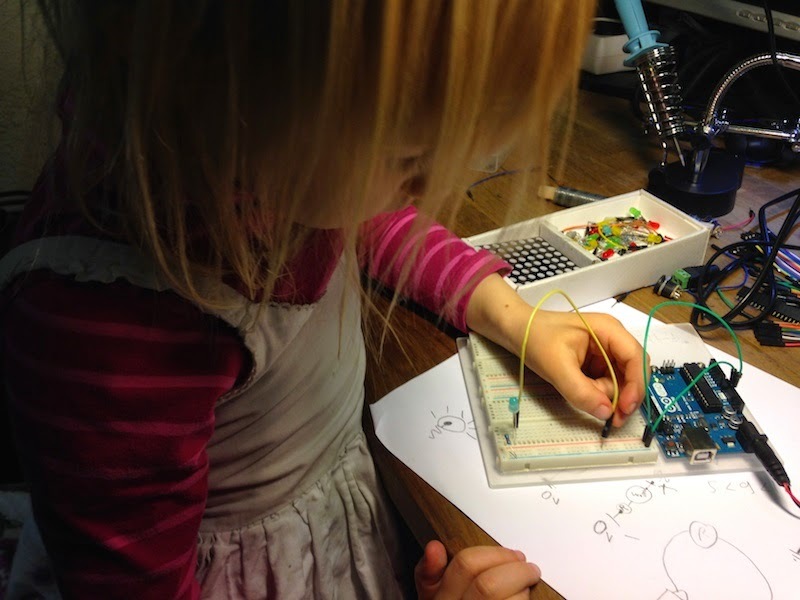 Yesterday we took a look at electronics and Arduinos. We discussed what electricity is and what voltage roughly means. We tinkered with some wires, leds and resistors to see that you have to make a circuit from the 5 Volt output of the Arduino into GND which stands for ground and is 0 Volts. We draw a lot of stuff on the paper to illustrate how our circuits worked. 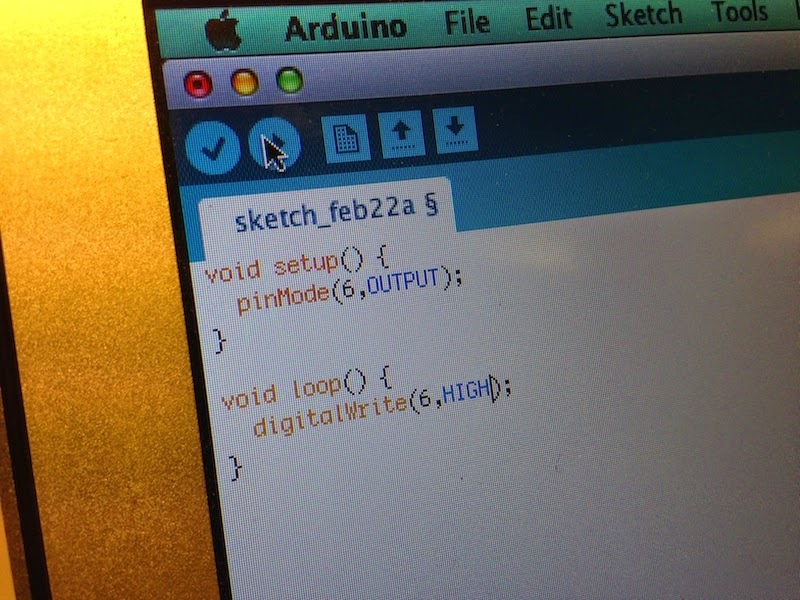 It was fun to use the 5 Volt and 3.3 Volt outputs of Arduino to run some motors (voltage affects run speed!) and then leds (you cannot feed 5 volts to a led or you'll break it!). She got really excited and told me she wants to build a robot that moves and talks. I used my consulting skills to talk this down to a single blinking led. We almost got that far in the end. So, from a talking robot down to a single lit led we went. But we had fun all the way. 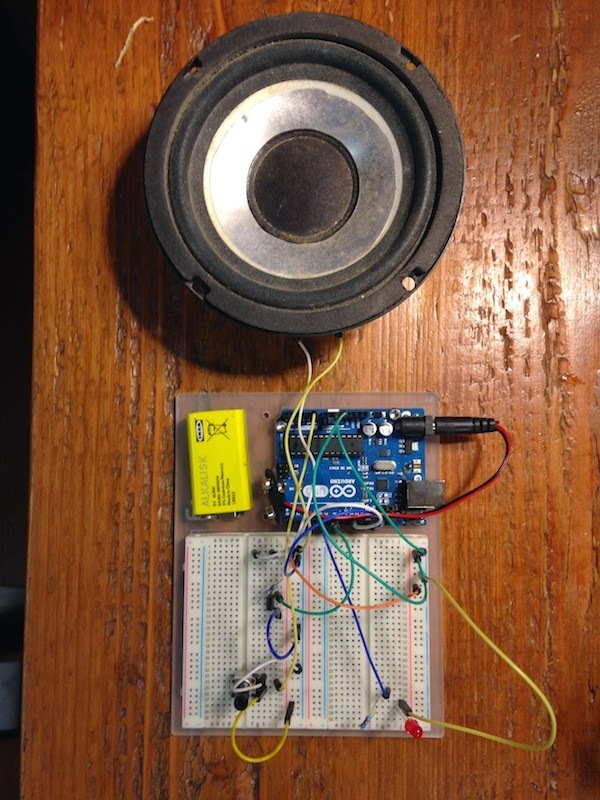 Today I build a simple instrument with a push button and a potentiometer for controlling output frequency. The speaker is actually the tweeter part of my 350W Hartke Bass Combo that got spectacularly destroyed on the stage some 20 years ago. Every now and then she asks for a computer lesson. Today that happened again and there we went. After a brief discussion we decided to try Turtle Roy again. It had been a while since the last time, but she remembered at least some of the basic stuff. She laid out grandiose plans of what she wants to achieve today and I told her it involves recursive algorithms. We decided to start with basics and try to draw a rectangle first. And then I got my computer back. After discussing how the algorithm should be constructed, she started editing it inline. I taught her one of my coding tricks. "Always type both opening and closing parentheses first and then add content between"
Maybe this is the lesson she'll always remember and will teach it to her own children later. After some editing, she had this. Nothing new this time really. But we had a good time and maybe we'll get to some new stuff next time, if we continue the saved program.